Journal Squared, designed by Hollwich Kushner (HWKN) and Handel Architects, marks a profound renaissance for the Journal Square area of Jersey City. The project follows a long history of innovative transit-based urban renewal projects by the KRE Group, whose prior developments include Grove Point, 225 Grand Street and 18 Park, also in Jersey city. 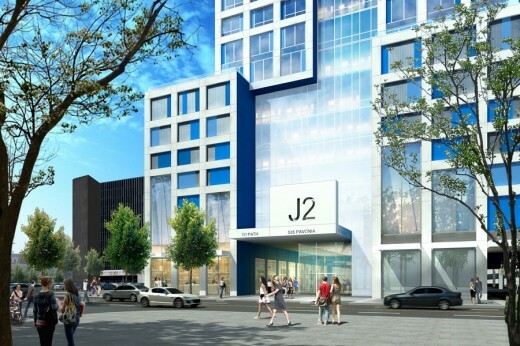 Journal Squared is an important milestone as Jersey City’s development boom moves inland. The project sits adjacent to the Journal Square PATH stop and promises to bring great density to the site while working to connect to the existing fabric of the neighborhood. “This is the right time and the right place for a transit-oriented development in Journal Square, and we knew that the design needed to be something extraordinary. HWKN and Handel’s ability to imagine a future for an entire community was a very powerful factor in our choice,” says Jonathan Kushner, President of KRE Group. Journal Squared is that long sought after transformational project. 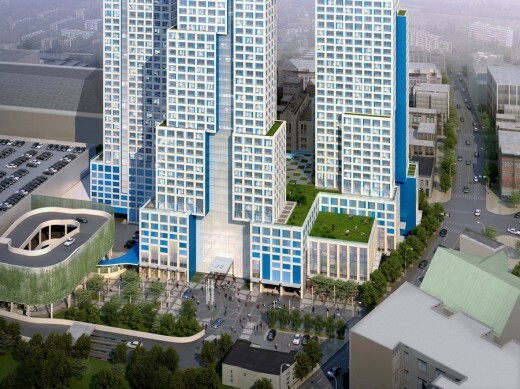 Unanimously approved by the Jersey City Planning Board, it will be the linchpin in the City’s Journal Square redevelopment efforts. The development hopes to create a prototype for future transit-oriented developments around the world. said Matthias Hollwich, partner-in-charge at HWKN. version of the Spanish Steps,” said Hollwich. The 2.3 million square foot project touches the ground lightly as its mass morphs into smaller units to relate to the lower density neighborhood around it. This base hosts active program like retail, restaurants, lobbies and parking. 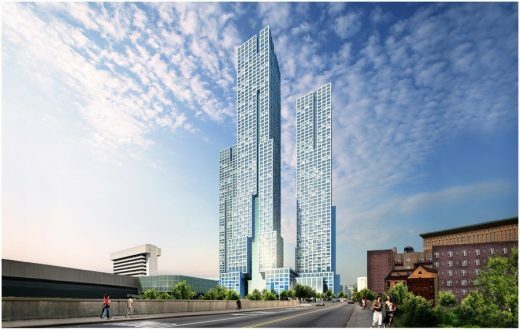 Three residential point towers rise above the base and include 1,840 units. 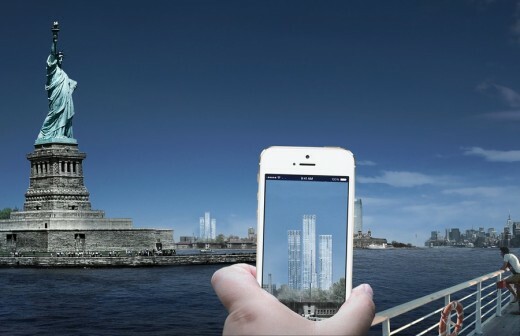 The tallest tower, at 70 stories, is expected to be the highest residential building in New Jersey. The first of three phases, topping out at 54 stories, broke ground in January 2014, and is expected to be complete in mid-2016. “We designed a building that works equally well at the scale of the Turnpike, where hundreds of thousands of people will see it every day, and at the scale of the human who walks and lives in the city,” said Marc Kushner, AIA, partner at HWKN. 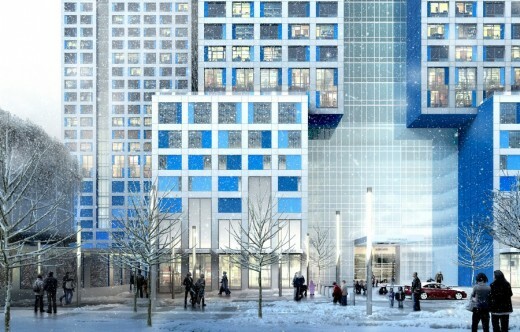 The graceful proportion and subtle luster of the metal panel clad towers will be an elegant centerpiece for the community and a bold counterpoint to the brutalist concrete PATH Station. In addition, Bruce Mau Design has developed the visual identity for Journal Squared, including wayfinding, signage, and environmental graphics. BMD created a look and feel that reflects Journal Squared’s core values as a bold, modern brand that is sophisticated and energetic, while staying true to the history of the neighborhood. Size: 2,300,000 sq. ft. in 3 phases. Phase 1 currently under construction, containing 540 units.